Where is the Groan Zone in Design Thinking? Abductive thinking is a skill crucial for Design thinkers. It refers to being able to stay analytical and emphatic, rational and emotional, methodical and intuitive, oriented by plans and constraints, but spontaneous at the same time (Tschimmel 2012,3). 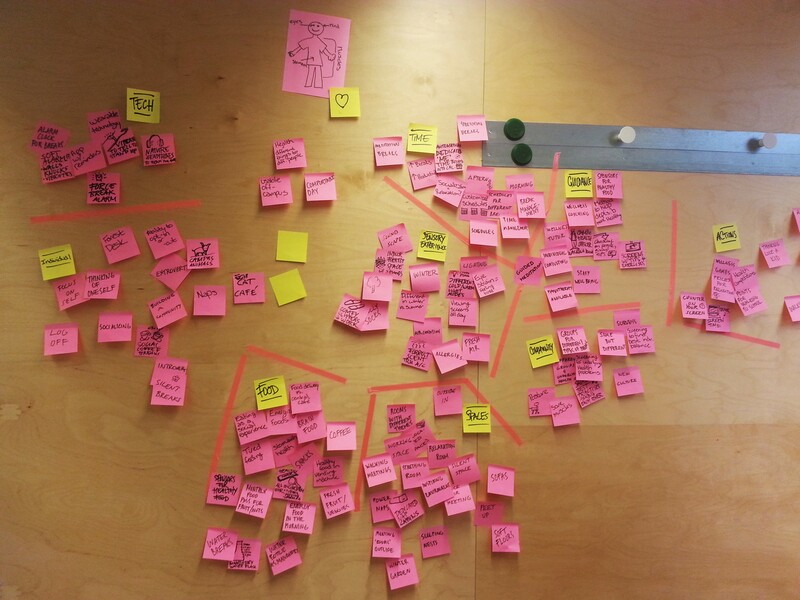 We practiced our best capability in abductive thinking in a two-day workshop with Katja Tschimmel, learning a process for Design Thinking called E6 developed in her company Mindshake. Trust the Process – There Will Be One Solution at the End! As facilitator I have worked quite a while with enabling better collaboration in teams. In the workshop I paid special attention to the process of divergent and convergent thinking, which is very important in creating new ideas – divergent meaning the space where we create new ideas and convergent the space where we make decisions and prioritize on the ideas. Tim Brown (2009, 68), explains that as design thinker it is important to have the rhythm of divergent and convergent spaces, and with each iteration arrive at a result that is less broad and more detailed than the previous iterations. I have worked with the Double Diamond process for quite a while, and I was fascinated about the level nuance in the E6 process in regards of convergence and divergence, which in this process were simply not only seen as phases in the process but as qualities of the different tools. I found this approach allowed for a very in-depth process. The Classical Double Diamond model – only two iterations with divergence/convergence. I liked how different forms of prototyping were present in different phases of the process, not only at the end, and how prototyping could also be a generative, divergent tool for expanding on the idea. In our group I noticed very clearly the value of our prototype in not only showcasing the consept, but also in expanding the idea, by working with our hands and thinking at the same time. Our first prototype allowed for lots of discussion and expanding on the idea. Some more detailed observations in regards to creativity were Katja Tschimmel’s instructions to brainstorming, which I found great. Often the problem with brainstorming is that ideas have a very different level of detail: some are on very high level and vague, others very specific and almost ready concepts. Often the problem in the Double Diamond method is that we tend to loose the more detailed ideas in the process of clustering ideas under bigger headlines. But in the Mindshake process the vague ideas were developed further and semantically confronted with other ideas to have more detail. I noticed that we did not end up in the famous Groan Zone, which lies somewhere between the convergent and divergent zones of process, where the group experiences feelings close to despair and has a very hard time finding their way forwards in the process. Even if some facilitators claim that Groan Zone is natural appearance in every process and can indeed produce some of the best solutions, I as facilitator try to minimize it in the processes I facilitate, since I feel that with the right tools the groups can often avoid it. I think that the reason why the process felt easy was the fluctuation between divergent and convergent – in most cases people feel at ease on one area of the process but not the other, and now they were allowed to find their comfort zone in many phases of the process. I still think I have some personal journey ahead to become a full Abductive Design Thinker, but this workshop was a great start on the path of creativity and collaboration. Brown, T. 2009. Change by Design. New York: Harper Collins Publishers. I took part in a Public Health Booster Workshop held in the Laurea Tikkurila Campus – a project formed together by the Laurea University of Applied Sciences, City of Vantaa and HealthSPA – the Finnish health ecosystem booster, a non-profit association for health startups, with its main aim at placing Finland among the top best in healthcare. 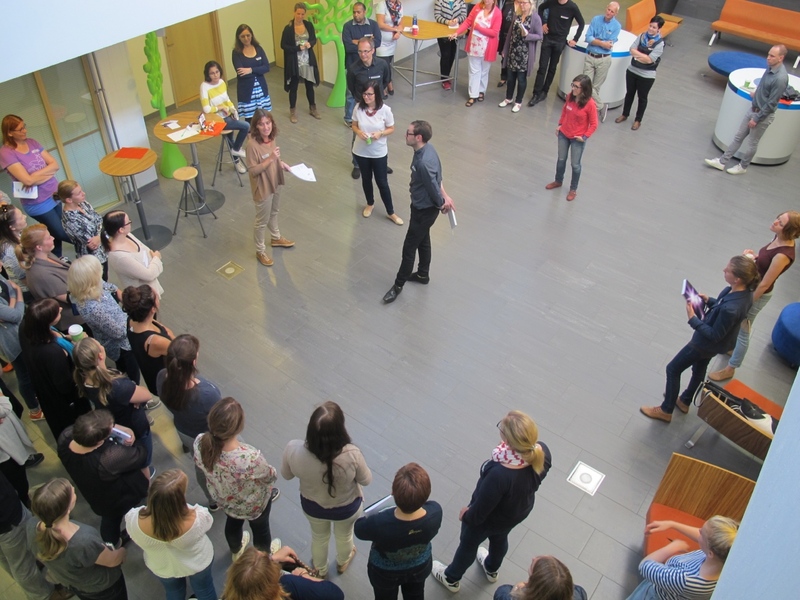 HealthSpa creates events, like this workshop, which matchmake healthcare professionals, students and startups and make it possible to improve the customer experience in healthcare and create new opportunities in cooperation. 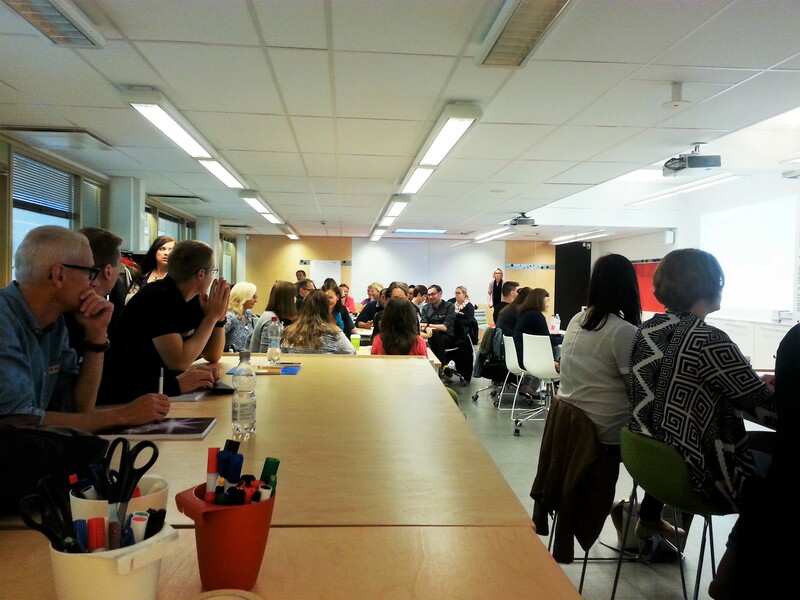 First we heard the opening words of Hanna Vartia from HealthSpa who introduced the main purpose of the workshop. 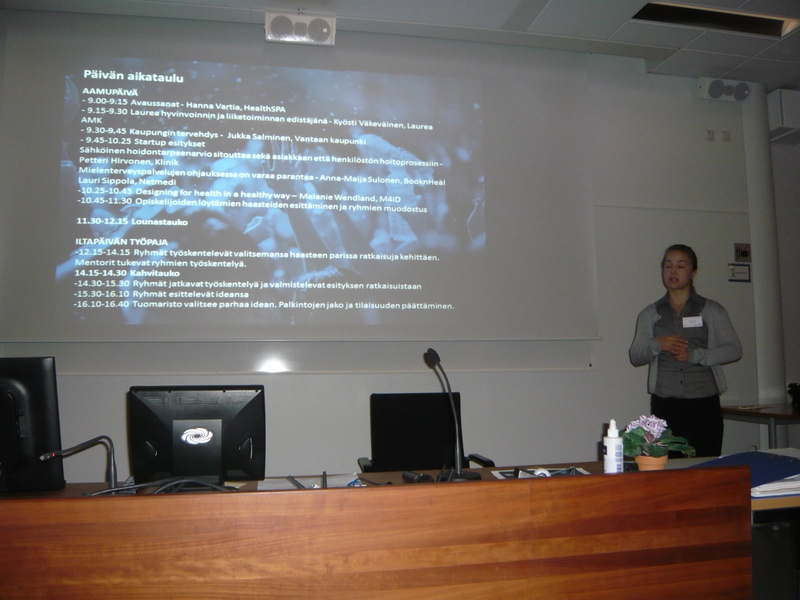 This autumn, Laurea healthcare students have taken part in the Public Health Booster Project by interviewing startups, City of Vantaa healthcare professionals and their clients. With knowledge of the existing problems that needed to be tackled they tried to find solutions to the challenges. After the HealthSpa introduction, Laurea’s V.C. 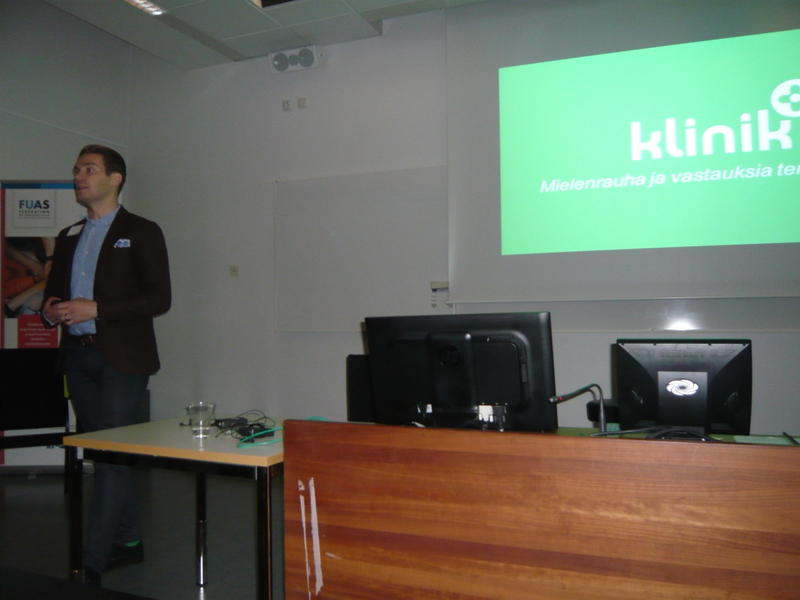 Kyösti Väkeväinen explained that annually 30 startups were formed among Laurea´s 7,000 students, making Laurea a cradle of innovators and innovations. The next speech was held by vice-mayor Jukka Salminen who said that the health care system “is not healthy” and should undergo a comprehensive innovation process with startups taking ideas to the next level and creating the kind of services the citizens would be willing to pay for and to buy straight from them. Design Thinking offers a variety of new ways to accelerate the creative process. 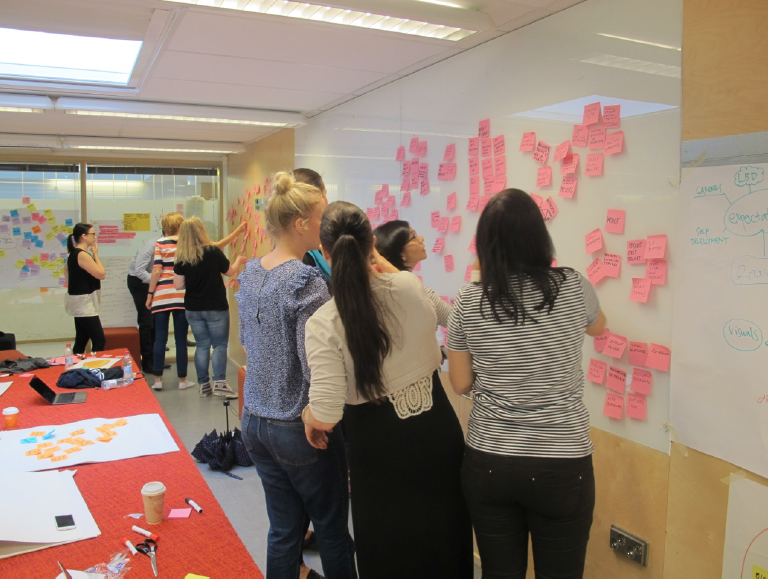 During the first contact session at the SID program we were immersed in the world of Design Thinking with an intense two-day workshop held by guest lecturers Katja Tschimmel and Mariana Valença. BRAINSTORMING is a widely spread idea generation tool that can be extremely effective when conducted appropriately. 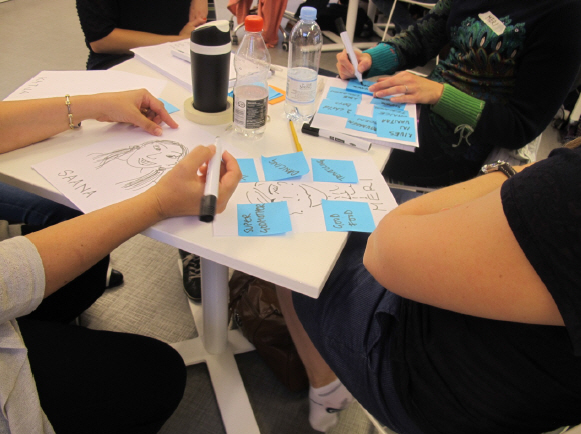 As explained in Katja’s article Design Thinking as an effective Toolkit for Innovation, brainstorming is a participatory idea generation session, which is done without discussing the ideas or thinking them through to the end. The main goal is to generate a myriad of ideas in a short period of time, being emotions and intuition more important that rational thinking. Team members start generating new ideas in complete SILENCE. Each of the members write down their ideas on post-it notes and sticks them on the wall (see Fig. 1). After a while, participants start elaborating on the other ideas. The goal is that an idea of one participant can be a source of inspiration for another. Brainstorming is a good technique to generate ideas that the whole group feels ownership of. While reading the book The Innovation Expedition I was introduced to the spiritual father of the brainstorming technique, the American Alex Osborn. From him I learned two essential rules when brainstorming – ‘Defer your judgment’ and ‘go for quantity’. The underlying assumption of brainstorming is that people are scared of saying something wrong.